After trying 4 GiB DDR3 memory from G.Skill, Crucial and 2 sets of Black Diamond - and getting the dreaded "beep-beep" memory POST failure whenever I put more than 1 DIMM in a channel - I found memory that is recognized by the BIOS at the full 24 GiB. Although this screen says 1333MHz, the OS and other tools say 1066MHz. Thank you so much for the detailed post! I received an update from a previous post inwhich i posted on that I was following that you replied too. Im actually also running kingston hyperx but I decided to go with 12gigs and it is running at 1333. But I did not purchase the 1600. So far so good knock on wood!lol Ive been running it close to a month now and no issues at all. system only uses 14% of my ram, I bet yours only uses 2! I also just put in a ATI 5670 with the original psu and am happy to say no power problems what so ever. Thank you again for testing all the different brands of ram and letting us know about it. I know now which one im sticking with! Actually, at the moment I have about 4 GiB of the 24 GiB free. Are you sure that it's running at 1333 MHz - the BIOS report lies. 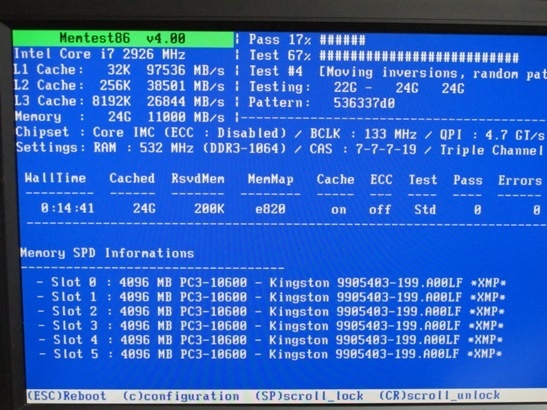 Note that the screenshot from Memtest shows 532/1064 MHz, and CPU-Z also shows 532/1064. You can get CPU-Z at http://www.cpuid.com/ - it shows a wealth of information about your system. 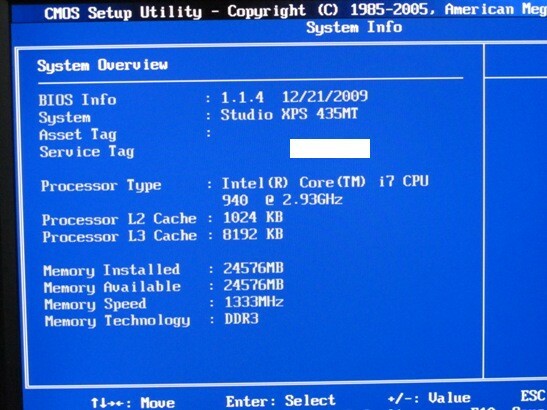 Check the BIOS screen pic and the CPU-Z listing - it's definitely the mini-tower with the two goofy side-mounted disks. I'm not holding my breath for a BIOS update - the actual performance improvement from the faster RAM would be very difficult to measure. Looks like I'm buying 24Gb memory and its not too badly priced over here in the UK - but nowhere near as good value as you managed to obtain it for. I'm curious. It says in your BIOS that you're running a 940 i7 @ 2.93GHz. I have a 435MT also but it is a i7 920 running at (stock) 2.66GHz. I would probably assume, though, this memory would still work. Also, why did you opt for the 1600MHz RAM instead of the 1333MHz, since if I understand correctly, this is the max speed for RAM the 435MT will handle? Although nothing is guaranteed, I wouldn't see why it would make a difference if you have a 940 (2.93) or 920 (2.66). Of course, get the memory someplace that has a ro "restock fee" policy just in case. 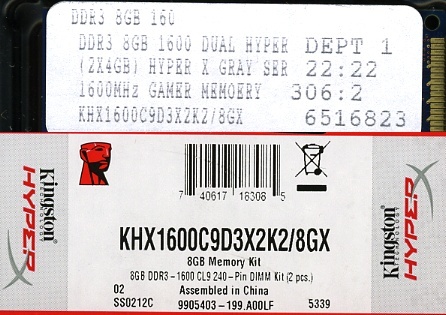 The Kingston memory has a 1600 MHz XMP profile, but the default is 1333/1.5v. And it wasn't really a matter of "opting" for these DIMMs. I tried many different DIMMs, and most got the dreaded "beep-beep" POST error. These Kingston DIMMs went on sale for $89.99 for two (8 GiB) with no restock fee. I tried two - they worked in the same channel. Next day I bought 4 more. They worked, and I have 24 GiB running without any problems. And, note that this "1600 MHz" RAM is actually running at 1066 MHz in my 435MT. I don't worry about that, though, because having 24 GiB of 1066 MHz is far better than having 12 GiB of 1066.